Six yearsago, NASA?s Mars rovers Spirit and Opportunity touched down on the red planetwith a team of scientists eagerly looking ahead to their short, three-monthmissions. As they embarkon their seventh year on Mars, the longevity of the plucky rovers continues toamaze their minders back on Earth, even with Spirit potentially permanentlystuck wheel-deep in Martian sand. 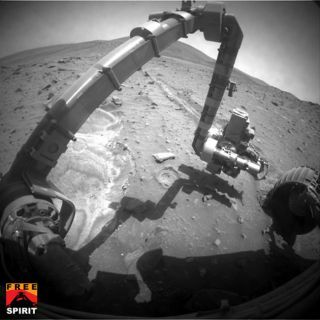 Spirit set down at Gusev Crater onJan. 3, 2004, at 11:35 p.m. EST, with its younger sister rover Opportunity landing on the otherside of the planet ? on the plains of Meridiani Planum ? more than two weeks later at midnight EST on Jan.25. While Sunday marks the mission?s sixth anniversary on Earth, it has onlybeen 3.2 Martian years since one year on Mars is about 687 Earth days long. Originallyslated to trundle across the Martian surface for only 90 days each, Spiritand Opportunity blew past those deadlines and have continued their missionsfor far longer than mission engineers ever thought possible. Opportunity evenpassed the 11-mile mark on its odometer earlier this year and beamed home morethan 132,000 images of Mars. ?They?reall so far out of warranty,? said Ray Arvidson ofWashington University in St. Louis. Arvidson isdeputy principal investigator for the science payloads on Spirit and its twin. Theobservations by the two rovers over the course of their six years on Mars havesubstantially shaped our understanding of the nature and evolution of theMartian surface, particularly by supplying ample evidence that at leastportions of the Martian surface were once wet. But thegoing hasn?t always been smooth. Spirit hashad a particularly rough go of it, suffering a set of computer glitches afterlanding, and coming close to a chilly demise last year as its power levelsdwindled during the dark Martian winter. The latestchallenge to beset the rover is a sand trap that Spirit fell into on May 6 asit moved away from a rocky plateau called Home Plate to a pair of targets 600feet (180 meters) away. The rover?s wheels fell through a thin layer of crustand became stuck in the sand below. Mission engineers have been working sine thento spin Spirit?s wheels to extract her. Spirit?ssituation hasn?t been entirely negative though, as its stuck wheels havechurned up dirt with interesting properties that suggest the site once hostedhydrothermal vents. Opportunity,meanwhile, has discovered its third meteorite on the Martian surface during itsongoing trip to the monster crater Endeavor, which is about 7 miles (12 km)away and nearly 14 miles (22 km) wide. What willhappen to the rovers and what they will find as they begin their seventh yearon Mars is anybody?s guess, though mission managers are concentrating onfreeing Spirit and getting her into a better position before winter sets in onthe red planet.